The rainforest – the frontier of lush greenery resonating with sounds of all sorts of life from the smallest, the peculiar and some of the largest species known to mankind. This is the pride of South East Asia’s landscape filled with majestic trees, great rivers and caves utilised by early tribes as shelters, food source and transportation. It’s is believed that the rainforest holds many keys to unlocking the secrets of life as depicted in tales and folklore of Asian cultures, yet the key to this forest’s survival lays in the simple hands of mankind itself. Being one of the top world countries with mega-biodiversity, Malaysia’s landscape has seen much changes since it’s independence in the late 1950’s. A nations pride for its heartland was once the route for insurgents in Northern Malaysia. Since ancient times, these forests continuously provides for the indigenous people whom today, are in transition to live closer to technological advancements, modernization and politics. Raw forest materials provides daily utility and used by all walks of life, from its application by indigenous people, to the commercial harvesting for daily city comfort. Acknowledging its importance, current measures are being taken by certain parties to further emphasise it’s sustainability. In Northern Malaysia, the simplicity of traditional indigenous houses are an astounding feature. 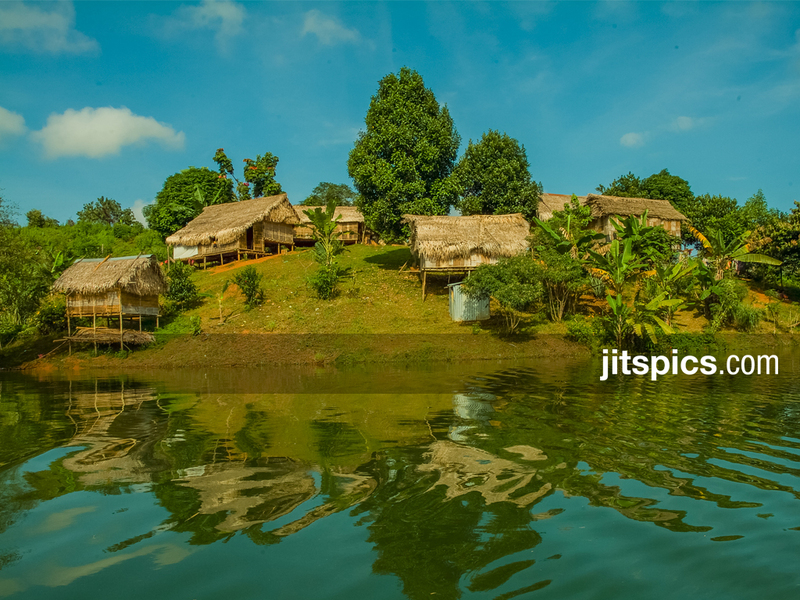 The Temiar tribe build their homes using wooden stilts for the structure frame bounded with bamboo using vines and leaves for the roofs, the interior of these houses often have a single main area for lounging and cooking with one enclosed bedroom for the elderly. 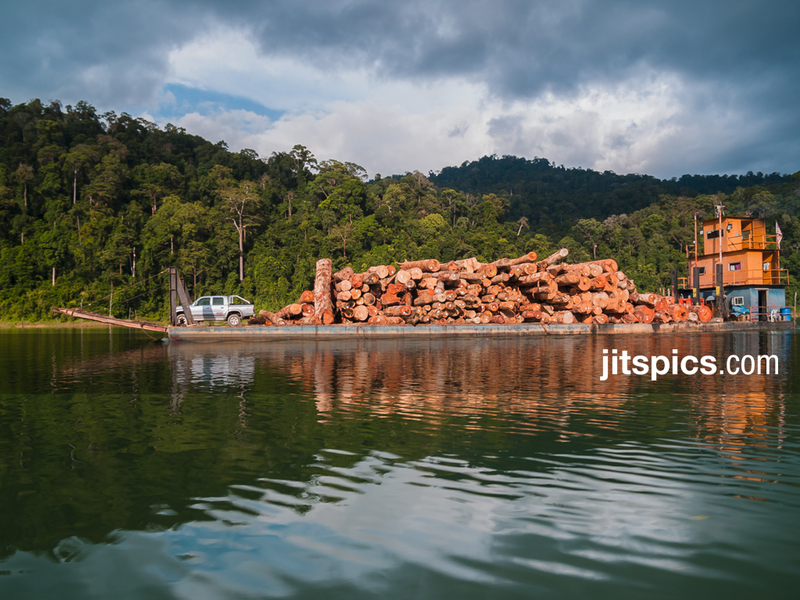 Indigenous tribes here live in communal family groups in individual houses, similar to Bornean longhouses whereas the structure of a longhouse is a single rectangular house with partitions. 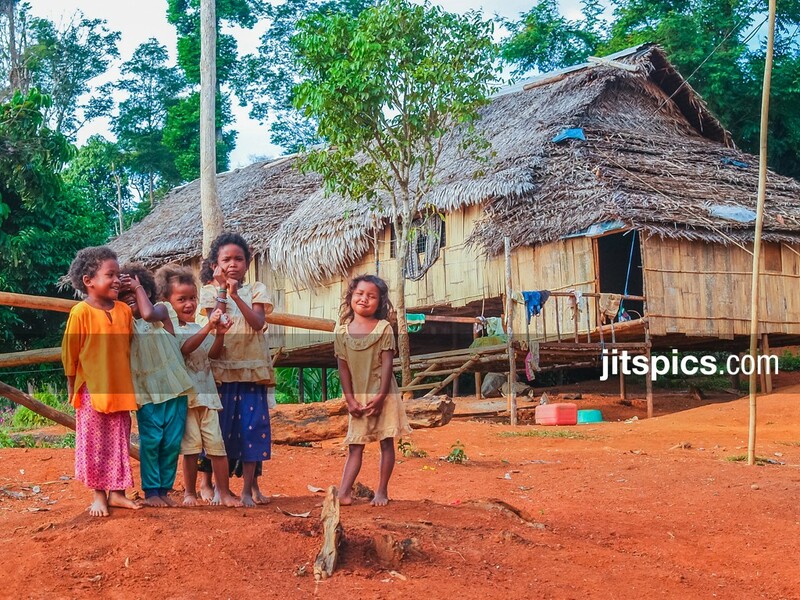 Temiar children of northern Malaysia standing in front of the frame of a new house tickled by the approaching photographer as the men folks were away harvesting wooden materials to complete the house. 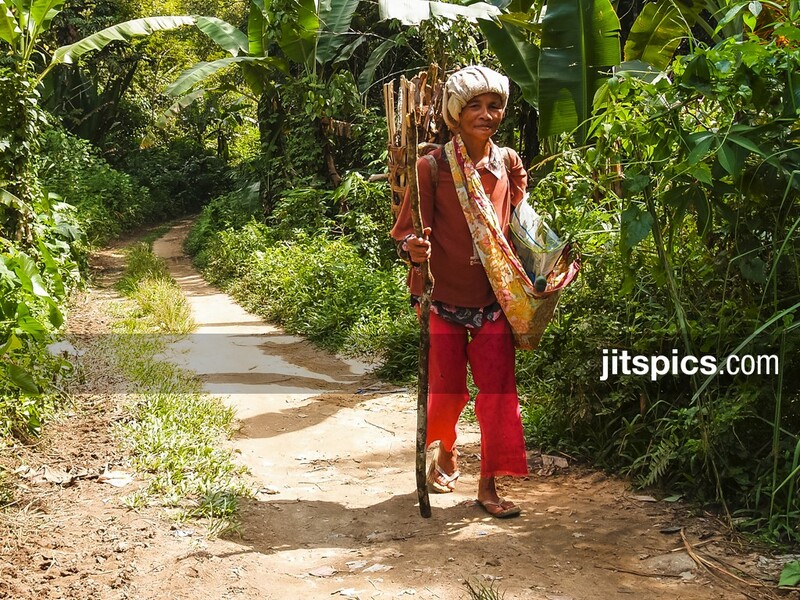 A Semai woman returning home carrying a hand made rattan basket after yielding sweet potato, fern leaves and firewood from her plantation. These forest produce are vital to their daily lives. Food is a significant part of social bonding. Gas tanks may be unavailable to villages deeper in rural areas, and considering the villagers income and lack of transportation, they usually find other means. 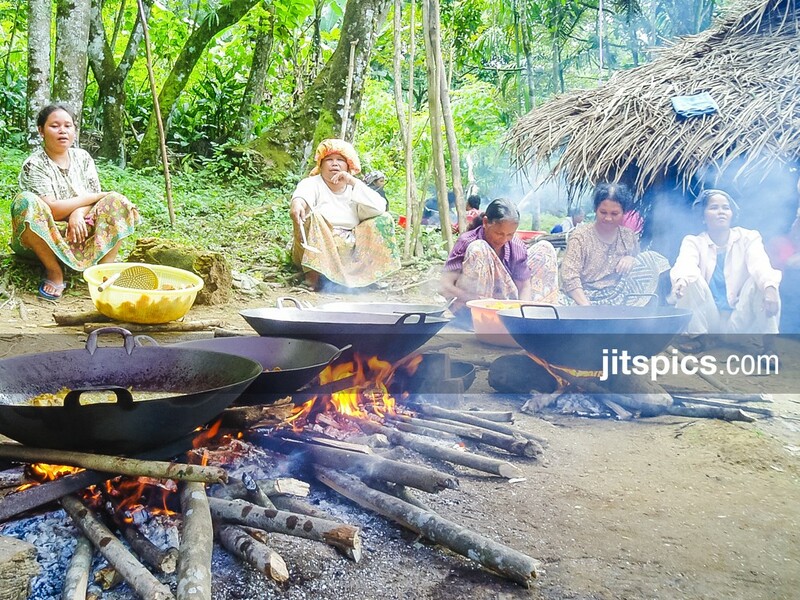 The Semai women here balance cooking pots on large stones taken from a nearby river and use wood as a natural burner as similarly practiced during their ancestral times. In this modernised village, the womenfolk are preparing a feast for a wedding ceremony. Food is aplenty and there is an open invitation to all that live int he village. Temiar children curiously looks on while paddling their home made bamboo raft from one village to another on a man-made lake. 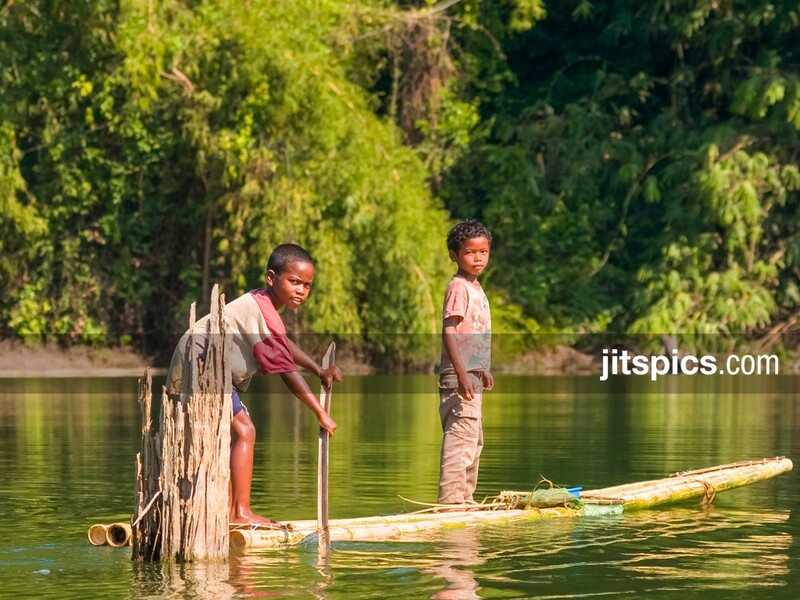 Since the flooding of the area for a hydroelectric dam, the tribes have been segregated to live on tiny islands which were once the tips of hills. 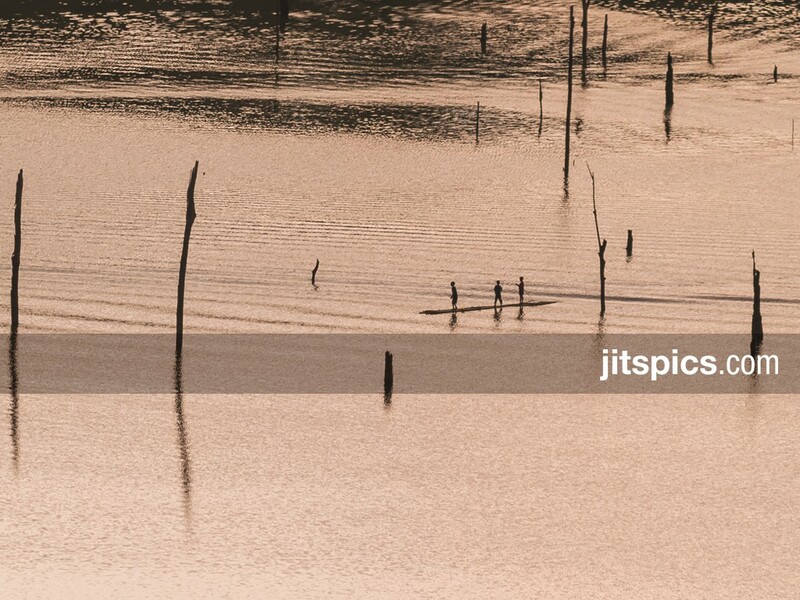 Bamboo rafts that were traditionally used for fishing are now also used to travel from one village to another. Hunting for food has also been the basic instinct for survival. The art of making blowpipes is an intricate process of selecting the right length, diameter, strength and straightness of a bamboo. The process is a true testament to patience as a blowpipe maker cannot rush the process, in fear of cracking the wood. In fact, he sits on higher ground to precisely drill through the bamboo piece by hand using natural tools. 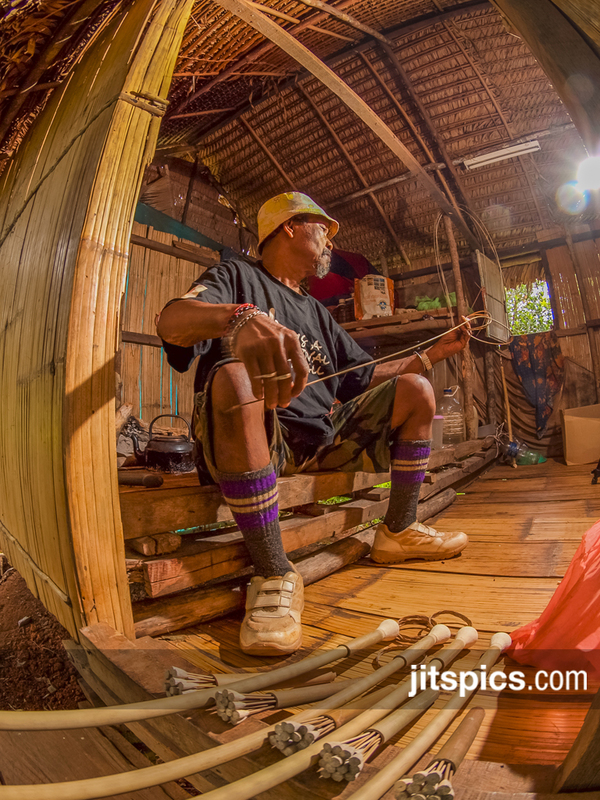 The blowpipe is then fitted with a mouthpiece and tied together with a rattan string. Other parts of Bamboo are used for the carrying case and poisoned tipped darts. The poisons are usually sourced from the pokok ipoh plant. A barge with large trees seen leaving a forest reserve. Deforestation is one of the major contributors to global warming. Malaysia has concentrated its efforts to renewing forest policies via various conservation NGO’s. According to FAO figures, the country lost 13.4% of its natural forest during the 1990s. the International Tropical Timber Organization (ITTO) has established general criteria for the measurement of forest sustainability and developed guidelines for the sustainable management of natural and planted tropical forests as well for the conservation of bio-diversity, Malaysia subscribed to ITTO “Year 2000 Objective”. Best management practices are truly in need to be implemented. The Chengal, an ultra hard wood takes between 70 – 100 years to grow before it reaches the appropriate size for harvest. 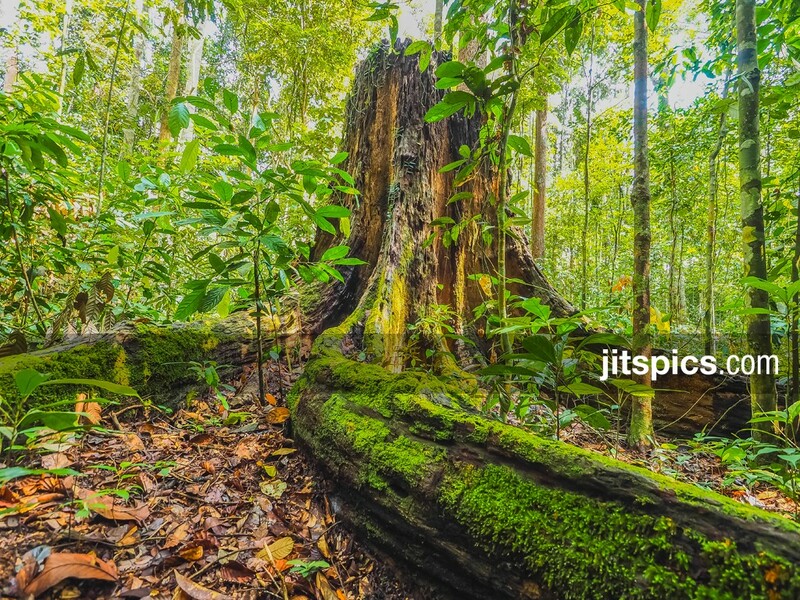 A remnant of this mighty tree lays fallen in Central Malaysia, a bitter testament to man’s greed. It was cut down and left abandoned near its roots after the illegal loggers failed to move the trunk of this majestic giant. 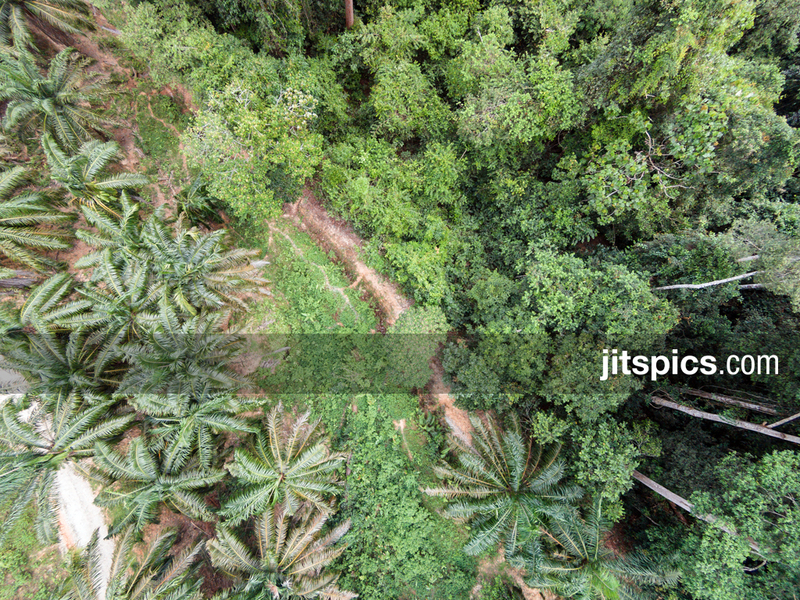 An aerial view showing the forest fragmented close to an oil palm plantation. The separation of forests without proper wildlife corridors have caused elephants, bears and other wildlife species to stray and get trapped in plantations. New management plans are needed to effectively deter wildlife and human conflict. 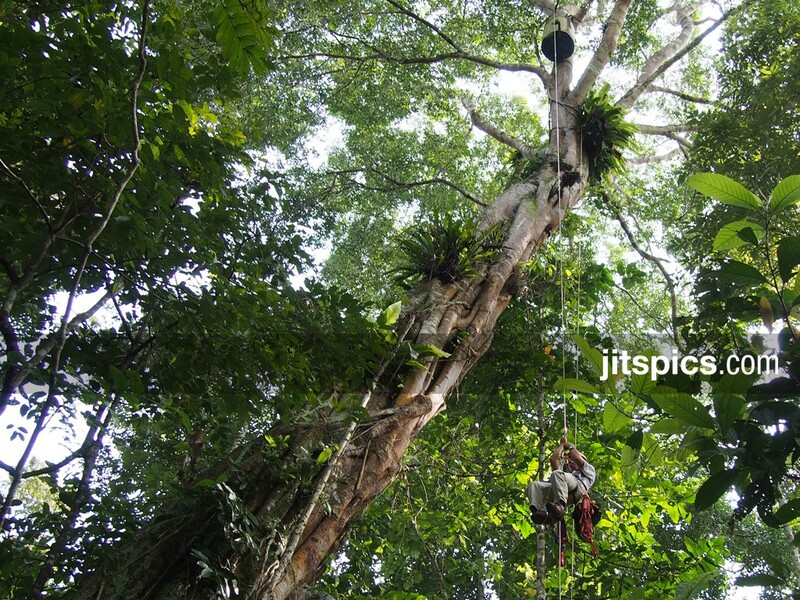 Conservationists in Borneo Abseiling 30 meters to investigate the contents of an abandoned artificial nest box and to retrieve camera traps. These techniques are focused to repopulate endangered species in highly fragmented forests. Much effort has been placed in education and training programmes to enable these sort of activities to take place. 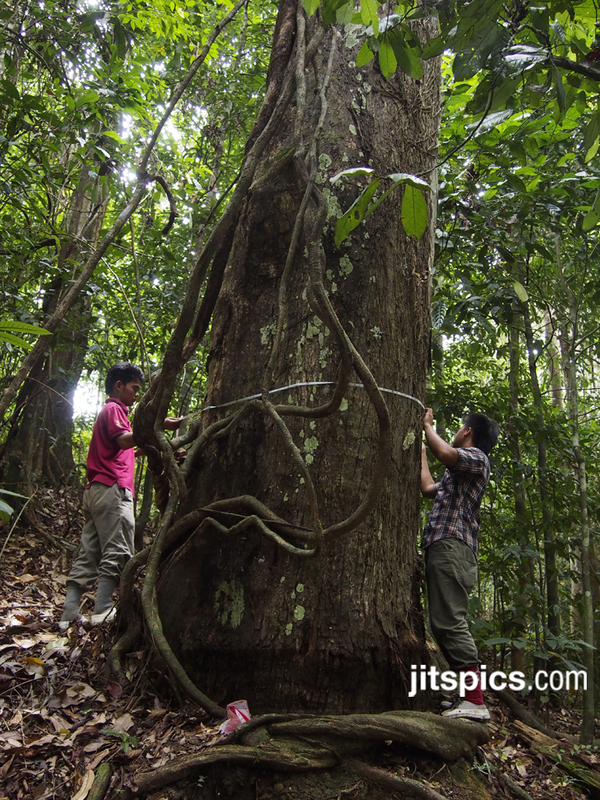 Forest surveys by local conservationists to record data on the growth of important plant species, fig trees and potential trees that provide food to various wildlife species. The relationship between plants, animals and humans are undeniable close. It is similar to any living beings’ primal instincts of survival. The future still remains uncertain as we struggle to find the balance between economic growth of a nation and upholding the grandeur of its natural heritage.